This week, human society takes a sharp left turn into an unknown but very interesting side-street. 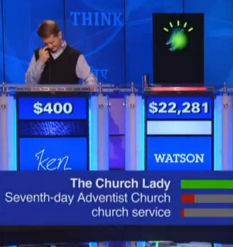 Jeopardy, TV longest running game show for brainiacs just got invaded by a computer intelligence from the future. Humanity, meet your new Overlord, Watson. Why do I care? Well, aside from the fact that it’s pretty insanely cool to see artificial intelligence reach this level of sophistication, there is a very direct bearing on the world of internet search and its symbiotic stalker, SEO. reply in conversational language. “‘Symbiotic’ refers to a mutually beneficial relationship among organisms, Dave” instead of a page full of possible answers ranked by some obscure algorithm. Which means, I’m afraid, the whole game is gonna change. With Watson deciding which internet content best answers your search for information, SEO strategies become irrelevant. It won’t matter how many links from important sites you have. It won’t matter how many times you used the keyword or where. You Fools Have You Learned Nothing from Terminator2?